Solid and sleek, Logitech’s K350 Comfort Wave keyboard strikes a good ergonomic balance with a familiar keyboard design. The Wave is no ergonomic powerhouse, but it’s tough to find anything not to like about this friendly and affordable keyboard. 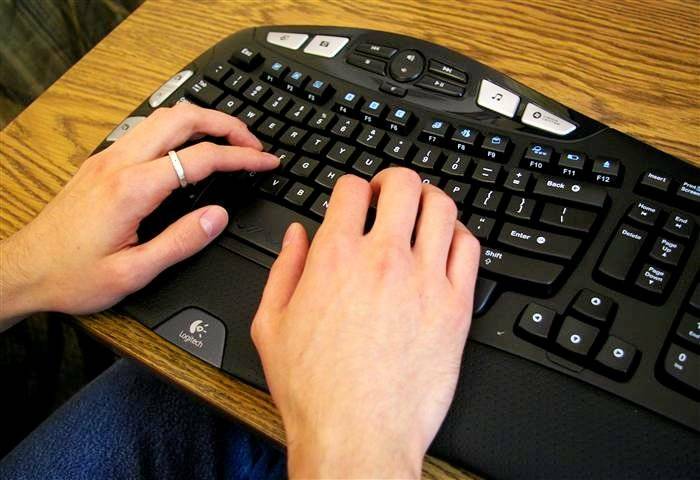 One of the biggest problems of ergonomics is the varying length of fingers on the same hand. My middle finger, for instance, is almost two inches longer than the pinkie. When you think about it this way, the rows of a keyboard shouldn’t be straight; they should be curved to match the fingers, K, for instance, pushed further out where the middle finger wants to be. Staggered-layout keyboards such as the Truly Ergonomic do just that – but these meet with resistance from touch typists who don’t want to learn anything new. The Wave addresses the problem in an interesting way. Instead of being staggered in the horizontal plane, its keys are staggered in the vertical plane. K, for instance, is where your middle finger expects to find it, but lives at the bottom of a “valley.” L and J are higher, and Semicolon and H higher still. 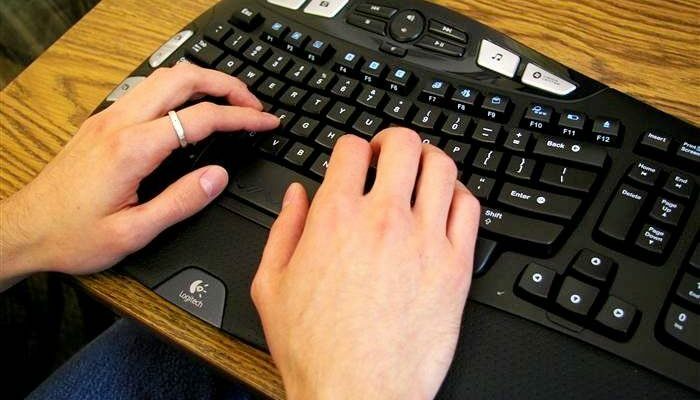 This shape, mirrored by each half of the keyboard, gives your longer digits room to unwind, while allowing the shorter fingers to reach their keys more easily. The low profile of the K350 makes it easier to get the keyboard down where you need it. 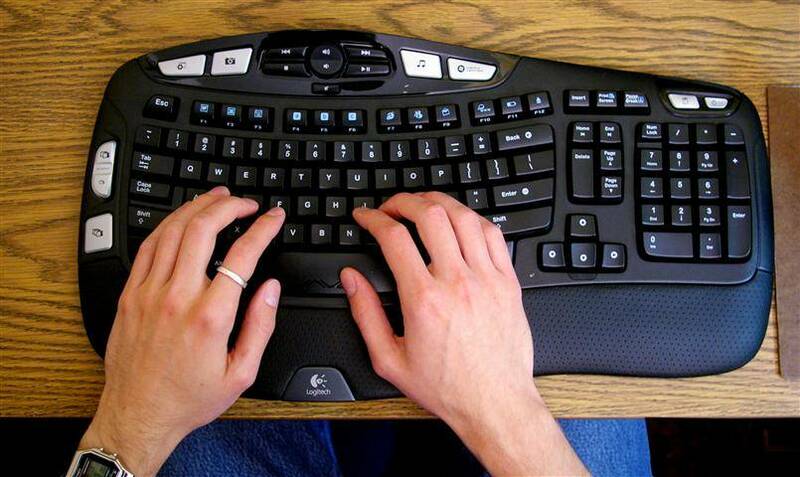 For an ergonomic keyboard, the K350 cuts a remarkably low profile. This thin form factor makes it easier to get the keyboard down to elbow level, which is an ergonomic plus. Another plus is the palm rest – invitingly smooth and soft but not squishy, giving you a place to park your hands while not typing. That’s right, while not typing. Locking your palms down on a wrist rest while actually typing is a shortcut to Painville. There’s nothing wrong with a palm rest, but use it like a park bench – not a crutch. While not a split keyboard, the K350 helps your arms angle inward, keeping your wrists straighter than a standard keyboard. Split-layout keyboards like the Microsoft Natural 4000 have around for years, claiming to reduce the risk of RSI by straightening out our wrists. Most people feel one of two ways about this split design: They love it and can’t live without it, or they hate it and can’t live with it. The K350 sneaks up on this second group by resembling an ordinary keyboard, while providing some benefits of the more radical split design. 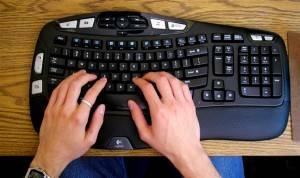 If you look at your arms while using the keyboard, you’ll find them angled slightly inward – not enough to mess up your typing, but enough to ease the twisting pressure on your wrists. I’ll say at least one thing for the key action on the K350: Compared to the Microsoft Natural 4000, it’s a bag of feathers. The Logitech’s spacebar, particularly, puts the aforementioned Redmond creation to shame. It’s not only easy to press, it’s also incorporated seamlessly into the whole Wave design, so that the thumbs rest naturally in its curves. The K350 won’t give you the snappy action of a Das Keyboard or even a Kinesis Freestyle, but it’s quiet, nice-feeling, and as good as any keyboard in this price range that I’ve tried. Like most consumer keyboards, the K350 has lots of special buttons. Its media control keys give you the usual play, stop, previous, next, and volume, as well as the handy mute for when the phone rings. With the exception of these, the K350’s special keys can be customized to do almost anything you want. Custom actions are assigned using the included Logitech Setpoint software. You can use these actions to open a folder, start a program, or input certain keystrokes. You can even define a custom menu to come up when you press a particular key, which is getting into some some pretty advanced stuff. As an ergonomics enthusiast, I like macros and shortcut keys. By automating certain tasks, they cut down on repeated physical motion. Even if a macro only saves three keystrokes twice an hour during your work week, at the end of the year you’ll have saved over 12,000 strokes – or about twice the text of this article. The reduced wear on your fingers adds up, particularly if you’re automating something you do many times a day. 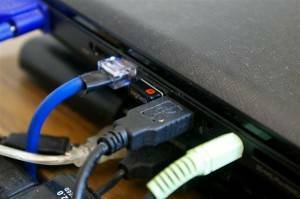 The wireless receiver is so small you can just barely see it peeking out the side of a laptop. When I bought my first wireless Logitech keyboard in the mid-2000’s, the receiver was a shocking thing of awkwardness that rivaled my mouse in size. The technology has come a long way from this early era. The latest Logitech receiver is about the size of your thumbnail – so small that you can leave it plugged into a laptop and barely notice it’s there. Better yet, you no longer need different receivers for your keyboard and mouse. As long as they’re both compatible Logitech devices, a neat technology called Unity enables them to use the same tiny receiver. Battery life on the K350 is reputedly outstanding, as in two years or more from the same set of included AA batteries. Wireless reception is a slightly dicier proposition, with certain reviewers on Amazon insisting that it’s totally flaky. In the few hours I used the keyboard, I did not notice any wireless issues. Your mileage may vary. There is one area of ergonomics in which almost all consumer keyboards fail, and the K350 is no exception. I refer to its 19 inch width, which, while fairly standard for a multimedia keyboard, can be a major ergonomic problem. 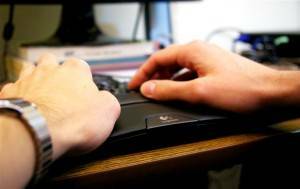 Most users are right-handed, or at least have learned to work on a computer that way. For this reason, the numeric keypad, a three-inch-wide section that many ordinary users never touch, was long ago placed on the right side of the keyboard. The trouble is, the mouse is also over there, and should ideally be occupying the very footprint allocated to the ten-key area. Since that’s impossible, most users simply move the mouse further to the right, then wonder why their right elbow starts acting up. If this sounds scary to you, you should probably consider buying a narrower-than-standard keyboard such as the miniscule TypeMatrix 2030, or the highly configurable Kinesis Freestyle. Are you tired of hitting CAPS LOCK by accident? All touch typists have done it at one time or another. We try to type “Clark Kent,” but end up with “CLARK kENT” instead – illustrating the fact that Caps Lock is close to, and easily confused with, Shift on most standard keyboards. In an apparent attempt to combat this common error, the K350 expands on an idea already in use by other keyboards. Like the medieval dukes who protected their castles with impassable moats, the Wave isolates its Caps Lock key with a deep indentation running around two sides of the key. In case that measure fails to stop big-fingered typists, the included driver software flashes an unignorable green notice across the screen whenever Caps is engaged. Nice touch, Logitech. With the K350, Logitech created a nice wireless multimedia keyboard with moderate ergonomic benefits. The width and fixed position are obstacles to true ergonomic bliss, but the Wave design is comfortable and requires little adjustment for ordinary typists. If you’re using a plain old keyboard like the one that comes with most computers, the Logitech K350 is a nice, affordable step up. Disclosure: This review was made using a complimentary sample from Logitech, which I gave to another person after finishing the review.